Lovely evening blue glaze gives a serene look to this elegant-but-sturdy handmade ceramic feeder. Like a glistening moonlit diner, Jo-Anne and Gerald Warren's Starlight feeder provides an elegant stop for large or small birds to eat a bite. Its delicate texture, created by hand with a special tool, allows our feathered pals to enjoy a comfortable meal without unceremoniously slipping. The Warrens sculpt each piece of Ohio stoneware clay and individually paint them with food-safe, evening blue glaze. Kiln-firing at over 2,000 degrees makes them strong and weatherproof. 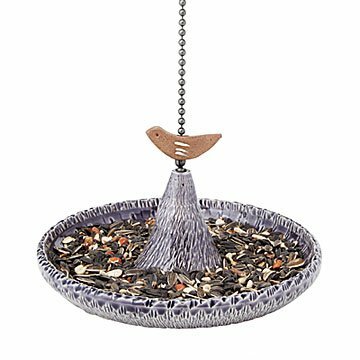 The sweet little-unglazed birdie perched on the chain it hangs from seems to announce to hungry squirrels: "This is a birds-only zone." Handmade in Canada. Love this product. Excellent quality! The quality is what stands out about this product. I gave this product as a gift and could not have been more pleased with how much the recipient liked it!